Overview - A timeless American idyll and a gritty evocation of turn-of-the-century labor, Terrence Malick’s glorious period tragedy Days of Heaven features Oscar-winning cinematography by Nestor Almendros. With only a handful of motion pictures to his credit in a career spanning more than forty years, Terrence Malick remains one of the most emotive and visceral filmmakers working today. Taking a near transcendental approach to his storytelling, the one time graduate student of philosophy conceives his films through visually profound images that either augment his lowly characters or contradict their fortuitous existence. What goes on in the background is equally as important to the narrative as the uncomplicated people who reside within it and are surrounded by it. By making great use of technique and style, Malick's films display a natural and realistic quality where happenstance emerges as the inevitable conclusion to a protagonist's environment and lot in life. 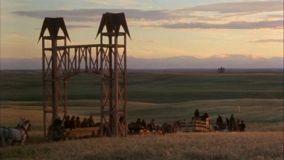 In my opinion, nowhere does Malick demonstrate this creative trait more thoroughly than in 'Days of Heaven'. After accidently killing a foreman at the steel mill where he works, Chicago laborer Bill (Richard Gere) is forced to run away. With girlfriend Abby (Brooke Adams) and younger sister Linda (Linda Manz) in tow, he escapes to the Texas Panhandle, where they are all hired as seasonal farmhands. To avoid scandal for being unmarried, Bill and Abby tell everyone they are siblings. As a wealthy landowner (Sam Shepard) starts to fall for Abby, Bill learns that the farmer suffers from poor health. Hoping they can prosper from the man's death, Bill encourages Abby to marry the farmer, but the man's health never worsens, and Abby starts to develop feelings for her new husband. As time goes by, Bill begins to see his plan fall apart. The film is a terrific example of the collaboration between director and cinematographer, which was partly done by Néstor Almendos and then completed by Haskell Wexler, though official recognition is typically given to the former. Although the plot was fully envisioned before principal photography took place, the final product arose from an editing process that required more than two years to complete. Much of the dialogue was abandoned and replaced with a voice-over narration, turning the film into a series of strangely edited vignettes of silent but expressive character interactions and gorgeously photographed landscapes. In the end, 'Days of Heaven' became a mythical fable about turn of the century life told majestically and poetically through its evocative images. Though not made explicit by its plot, the story also shows the routines of immigrant life during pre-World War I America. While the U.S. had already completed expanding its borders to the Pacific Coast by the end of the 19th century, many newcomers to the country were making their own way westward in the hopes of a better life. Whether through the love triangle of descendents of immigrant families, or the farmhands that come and go, we are ultimately seeing a lower class emerging and surviving in a new, almost-heavenly land. The film moves languidly, much like the pace of life itself in this region. These unskilled laborers are also surrounded by industrial advancements in nearly every frame. From the large, monstrous farm equipment to airplanes and automobiles, we watch simple rural reality through a misguided love affair in the midst of technological progress. Drawing obvious inspiration from Vermeer and Edward Hopper, Terence Malick captures the lives of these people in a minimal fashion that, with the help of the cinematographers, produces a collection of gorgeous and stunning moving photographs. The film is told through the eyes of a someone too young and innocent to fully comprehend the complexities involved in the many silent interactions, yet her reflective comments never the less reveal acute brilliance. When we finally arrive at the film's concluding moments, both Abby and Linda are seen following the train tracks to an unknown destination. But while one seems intent to apply the hurried pace of the locomotive, the other chooses the leisurely movement of traveling by foot. The meaning of these lasting images is another part of the film's ambiguity and beauty. And next to 'Badlands,' this is arguably the director's best work. 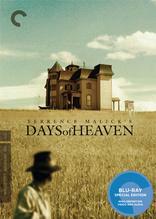 This Blu-ray edition of Terrence Malick's 'Days of Heaven' comes by way of The Criterion Collection (spine #409) on a Region A locked BD50 disc and housed in their standard clear keepcase. Accompanying the disc is a 40-page booklet with color pictures of the film, featuring one essay entitled "On Earth as It Is in Heaven" by Adrian Martin and a reprinted chapter from Néstor Almendos's autobiography A Man with a Camera titled "Shooting Days of Heaven". There are no trailers or promos before being greeted by the distributor's normal menu options. Since its original theatrical run, 'Days of Heaven' has enjoyed several home video releases on various formats. For this Blu-ray edition of the Terrence Malick favorite, Criterion struck a new high-definition transfer from the original 35mm negative and the process was personally supervised by the director, cameraman John Bailey, and editor Billy Weber. Needless to say, this approved 1080p/AVC MPEG-4 encode provides a marked improvement over previous releases and is sure to make fans very happy with the upgrade. Presented in its preferred 1.78:1 aspect ratio, the high-def picture is not likely to make an impact on those looking for the latest demo material since it's fairly inconsistent and the print definitely shows its age. Although blacks are mostly deep and accurate, some notable portions slightly lose their luster, particularly during low-lit interiors. Nighttime exteriors maintain better brightness levels, but they also tend to come off a tad too strong, which is the result of intentional photography to shoot in natural firelight. Shadow details are affected somewhat by all this, yet visibility is nicely sustained. Contrast is a bit of a mystery, looking perfectly balanced in numerous sequences and slightly weaker in a few others. Even though this is the sharpest the film has ever looked, there are a few times when it looks softer than some of its best parts, typically in those same night interiors. It's nothing hugely detrimental but easily observable while enjoying the movie. Despite all this, the transfer perfectly preserves the deliberate -- and experimental for the time -- photography of Néstor Almendos, capturing a strange sense of the idyllic and the plaintive within prosaic scenery. The image is awash in grain which doesn't hinder the visuals greatly, and several scenes look absolutely stunning with wonderful detailed clarity and perceptible texture, while a few others are not as well resolved. While reds and greens gain significantly in the jump to high definition, appearing vibrant and lively, the rest of the palette is a varied collection of pastels that are warmly and richly rendered. Any visible drawbacks are due to the age of the source and kept to a minimum for one of Terrence Malick's most visually striking films. According to the booklet, the DTS-HD Master Audio soundtrack is also a remaster from the original 4.1 magnetic track, and the results are truly remarkable. The lossless track displays warm and inviting imaging with clean dynamic range and appreciable clarity in the soundstage. Dialogue reproduction is perfectly delivered in the center, channel separation is satisfying, and low bass shows notable improvement, providing terrific palpability to those few scenes of action. Despite being a front-heavy mix, rear activity is often put to great use. It may not be very immersive, but the subtle sounds of wind, distant wildlife, and the infestation of locusts fill the soundscape to generate a pleasing atmosphere. The codec's most impressive aspect is Ennio Morricone's musical score creating a wonderfully engaging and welcoming presence. On the whole, this high resolution track of the film's lovely sound design is a marvelous upgrade. The Criterion Collection provides 'Days of Heaven' with a healthy package of supplements that mirror those found on the 2007 DVD release. Though Terrence Malick is missing, which is typical of the director, the interviews are quite enlightening and fans are sure to enjoy the featurettes. Audio Commentary - Recorded exclusively for Criterion in 2007, the commentary track features editor Billy Weber, art director Jack Fisk costume designer Patricia Norris, and casting director Dianne Crittenden. This is an enjoyable and technically informative conversation with scene-specific ponderings and polite yarns about working with the director. It's a great listen for anyone wanting to learn more about the production. Interviews (HD, 34 min total) - Viewers can enjoy this assortment of four insightful interviews, provided as four separate clickable segments. The Richard Gere portion is an exclusive for The Criterion Collection as he discusses his preparation for the role and his experience working with the director. Sam Shepard also divulges some of his memories accompanied by a few thoughts on the film's value. John Bailey, who worked as camera operator, and Haskell Wexler talk about the technical aspects of the shoot, realizing Malick's vision, and the renowned cinematographer Néstor Almendos. All four interviews make for a great watch that's suggested for anyone wanting more insight behind the film. 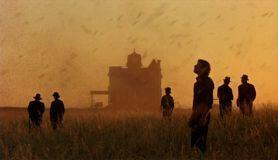 Next to 'Badlands,' 'Days of Heaven' is arguably Terrence Malick's best work. While the film is about a doomed love affair between a wealthy farmer and his lower class employee, the environment which surrounds them plays an equally important role in the overall theme of simple life in the midst of progress. It's a series of gorgeously photographed landscapes, made even more beautiful by this high-definition transfer. The Blu-ray edition also provides a terrific audio presentation and a nice supplemental package. Fans will surely want to purchase this latest release from The Criterion Collection, and everyone else is encouraged to give this Terrence Malick classic a watch.